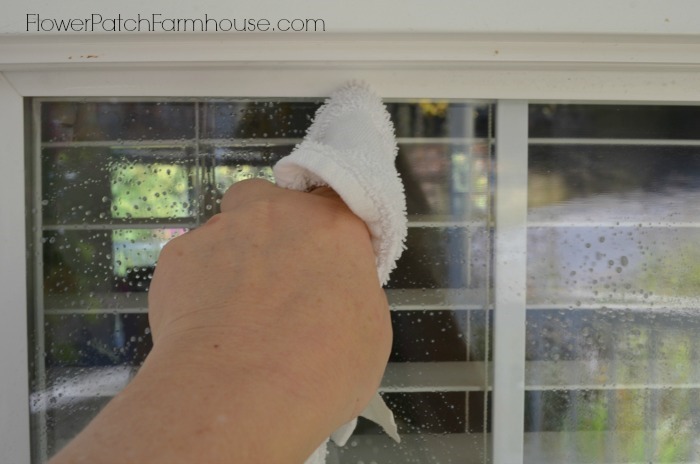 Window Cleaning Tips from a Pro, as a retired house cleaner I have tried many methods of cleaning windows. This is by far the fastest and easiest I have personally used. I have seen a few window cleaning posts online but none of them supply one vital tip that made my window cleaning efforts so much faster and easier. I no longer clean professionally, I now blog full time but when I did clean this technique was a game changer for me. I was paid by the unit (per house not by hour) so speeding things up while maintaining quality was key. This trick was taught to me by someone who ran a window cleaning service, and they charged by the window so I know they found it to be most effective too. I also have used Dawn but since it is a concentrate use just one drop! Do not use any soap with moisturizers in it. So now I use Dawn Hawaiian scent, which is a concentrate so one drop is enough. I like the shine I get after using my spray mixture and the added grime busting ability but it is not absolutely necessary, you can just scrub down the window with the dawn solution that is in your bucket if you wish. Liberally spray the dirty window with the homemade all purpose cleaner. The alcohol and ammonia really help cut the grime. 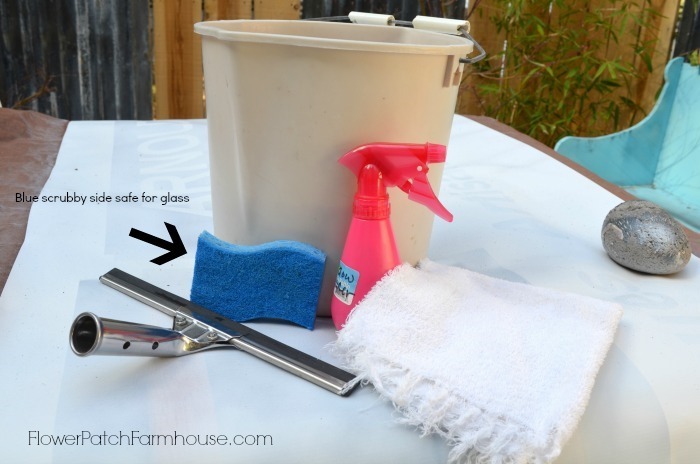 Using your window scrubber or a glass safe scrubby sponge, dip it in your bucket of warm water and scrub it down. If it has been a long time since your windows have been cleaned this may take a bit of scrubbing. Just FYI In the photo I am using the wrong type sponge, use only the blue ones for glass. When I photographed this I made sure not to use the green scrubby side of this sponge, that could scratch the glass. I actually now prefer the professional window scrubber that is listed in the Amazon link. 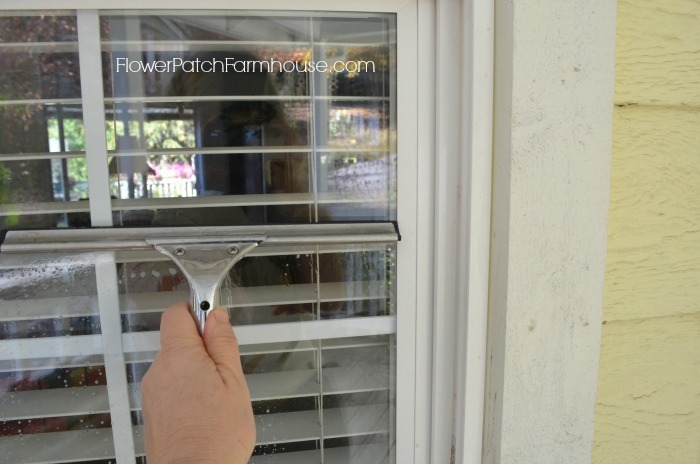 It does a wonderful job and has an extension that makes higher windows easier to clean. Use one of your clean dry towels, put it over your finger and rub it along the top and side edges of the window. This creates a dry clean edge for the squeegee to work from. Start you squeegee on either side with the top and one edge in the dry areas create by your towel covered finger. Wipe the squeegee with a dry towel between some of the swipes. The dry edge creates the perfect surface to get a good start and you don’t have to be up against the window edge and causing missed spots. There is little to no cleaning up leftover drips from the squeegee when you use this method making it much faster. 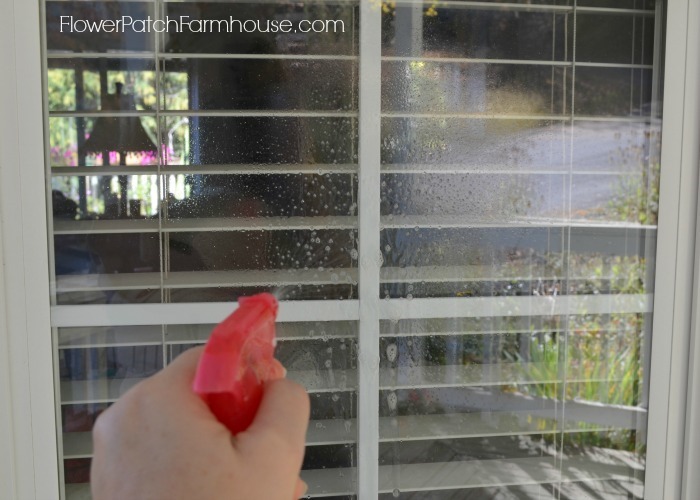 Once you are done squeegeeing the window is sparkling clean with no streaks! 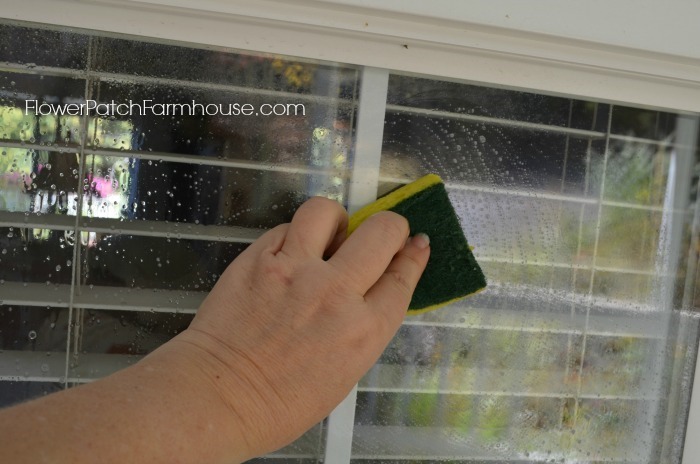 If you don’t have a squeegee you can just spray with the cleaner and wipe dry with paper towels or a microfiber cloth. That days take more time and effort but it gets the job done. This is how I’m going to do it this year! Thanks, and keep up the good (hard) work! I’m definitely going to try this – thanks!! It is well worth it, it has cut my window cleaning time and makes it less tedious. I like making things as easy as possible on myself. Its too good for sharing such a amazing post of cleaning service,its informative. of his work? seriously doubt i have time to do the glass, appreciate your input. Great article related to window cleaning, thanks! This is fantastic! We just launched our website for our window cleaning services and came across this article. One of the things that I love that you included was the use of distilled water in place of regular tap water so as to reduce water spots. It’s obvious that you spent some time researching this and then implemented it. Thanks for the great information! Love your recipe for cleaning solution. We have one we currently love, but are always open to trying new things! Also, great tip to be picky about the tools you are using, for example, always try to at least use a cloth and never a paper towel. Here’s to happy cleaning!